Situated in Estagel, this bed & breakfast is within 9 mi (15 km) of Musee des Premiers Habitants de l'Europe, Museum of Tautavel European Center of Prehistory, and Forca Real. Lac de Caramany and Clot de l'Oum Winery are also within 9 mi (15 km). 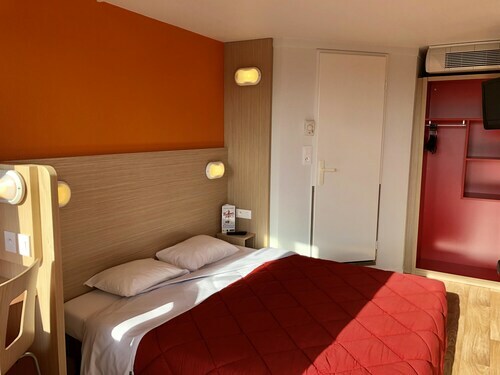 Situated in Perpignan, this hotel is 2.4 mi (3.9 km) from University of Perpignan and within 6 mi (10 km) of Republic Square and Le Castillet. St. Jacques Church and Campo Santo are also within 6 mi (10 km). Located in the heart of Perpignan, this hotel is within a 5-minute walk of Le Castillet, Perpignan Cathedral, and Loge de Mer. Place de la Loge and Campo Santo are also within 10 minutes. Perpignan Station is 19 minutes by foot. Situated near the beach, this hotel is within 1 mi (2 km) of Aquarium de Canet-en-Roussillon and Canet Beach. Saint-Cyprien-Plage and Mas Baux are also within 6 mi (10 km). How Much is a Hotel Room in Estagel? Hotels in Estagel start at $40 per night. Prices and availability subject to change. Additional terms may apply. You may have realized that there aren't any options on Travelocity in Estagel. There's no need to stress, because there are 6 places to rest an easy drive away. The Riberach, Languedoc-Roussillon, which is the closest accommodation option, sits 6 miles (10 kilometers) from the heart of downtown Estagel. A secondary convenient alternative is the La Villa Duflot, situated in Languedoc-Roussillon, about 11 miles (18 kilometers) from central Estagel. 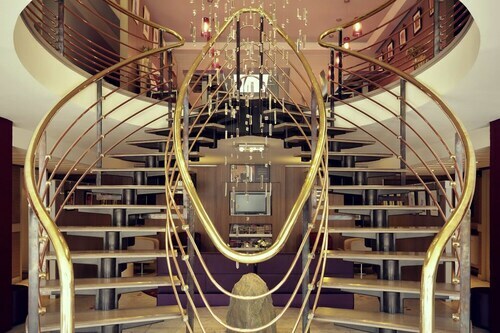 You could investigate the Novotel Perpignan and the Best Western Hotel Windsor. The Novotel Perpignan is located just 10 miles (16 kilometers) away from the center of Estagel. The Best Western Hotel Windsor, is located 11 miles (17 kilometers) away. Two more accommodation options close by are the Appart-Hotel de la République as well as the Hotel La Fauceille. Once you have got to know Estagel, you could set out to soak up the many natural and cultural attractions of the Languedoc-Roussillon area. Languedoc-Roussillon boasts beaches, and commonly visited attractions are ruins, castles and traditional villages. In this fascinating part of France visitors can also take up the chance to partake in snowboarding. Collioure is 25 miles (41 kilometers) southeast of Estagel and features Royal Castle and Church of Notre-Dame-des-Anges. A few Travelocity-listed Collioure hotel options include the Grand Hotel du Golfe and Hôtel les Mouettes. Or, you could consider staying in Argeles-sur-Mer, 25 miles (36 kilometers) southeast of Estagel, where you can choose from the Château de Valmy and Hôtel Le Lido. The Argeles Beach and Argeles Adventure are some of the more frequented places to see when visiting Argeles-sur-Mer. Simply because you and your family are on vacation, who says you can't fuel your obsession for a day watching sports. You'll find Stade Gilbert Brutus 10 miles (15 kilometers) to the east of Estagel. Sleep nearby to the action at the Mercure Perpignan Centre or the Quality Hotel Centre Del Mon. Perpignan - Rivesaltes International Airport is a primary airport, and is located 8 miles (13 kilometers) from Estagel's central precinct. Travelocity-listed hotels close to Perpignan - Rivesaltes International Airport are Comfort Hotel Centre Del Mon and Hôtel De La Loge. There is nothing French about this hotel....large modern rooms with separate WC plus double vanities and a bathtub. We visited at the end of their peak season so the hotel was not full. It seemed to be popular because of its spa although we did not use their services it looked nice. The beach had nice soft sand and was clean. The mediterranean was fantastic for swimming. They had a good continental breakfast with eggs made to order. The dinner menu however was limited but was still tasty by North American standards. Most of the staff spoke some english but when you left the hotel there were fewer english speaking people. This area is less touristy then the Nice/Cannes side of the mediterranean in France and is mostly occupied by retired people. There are restaurants and cafes within short walking distance.